You might have wonder why this little space was so silent, well I've been working really hard sketching, vectorizing and painting the new Illustration print line for my shop =] And I'm beyond excited to finally (an officially) launch it today! As I mention in a previous post, one of my goal for this year was to go back to pen and paper, draw more and try new things. And this is a new as it gets, I had the idea of selling prints for two years now, but I was always too busy to invest time on that little venture. So to celebrate 2 of my lovely readers will get an 8″x10″ print! 2 – What print you'd like to win! As easy as that! This giveaway is open for International readers as well =] and also I am offering an awesome 20% OFF everything in my shop using the code “PRINTLAUNCH” at checkout until February 6th (I will also pick out the winner that day!). I will email you ladies soon to send the prints your way! and thank you everyone for participate and don't worry there will be another chance to win a print soon for everyone following me on Instagram! https://s3-us-west-1.amazonaws.com/howjoyful/wp-content/uploads/2013/01/27075115/prints.jpg 100 100 Joy https://www.howjoyful.com/wp-content/uploads/howjoyful-logo-1.png Joy2013-02-01 09:34:092013-02-14 17:00:07Launching my new print line with a Giveaway! Great job on your Etsy shop – the notecards are fabulous! I especially enjoy the “you are pretty awesome” ones. I know many people who I could send them to! I really love the Rainbow Wishes print. Just beautiful – and appropriate for us as we were blessed with a baby son in October. I would love to hang it in his room where he could see it each day. Congrats on your new shop! They are all amazing, but my favorite is the Dream Big balloon! Love the Dream Big Little One print. So adorable and would like sweet in my little one’s nursery! My favorite item is the “You Are Pretty Awesome” cards. I love them so much! I’d love to win the I love coffee and my blog print! I love, love, LOVE the notecards – the hello gorgeous and you are pretty awesome! PS I just got my business cards today and they’re gorgeous! Love seeing your progress on Instagram! You are one busy mama taking care of your sweet baby and finding the time to create new prints for the shop. Your notepads are gorgeous, and my favorite print is Dream Big… Little One. I have been eyeing it since seeing it posted on Instagram and so excited that it is available now. Thanks for the great giveaway! Oh my awesome! you create such wonderful things!!!!! oops, that was be honest, not creative. But you get the jist! I love the Insipration notepad…..ironic because your blog (& Etsy site) has been an inspiration to me!! The print that I would love to win is the Rainbow Wishes one. I would love to display that in my house so that my kids can constantly see those wonderful lessons for life! I love your new print line! I especially love Rainbow Wishes because of the bright colors and beautiful sayings that are little reminders every day. My favorite, and the one I would want is the Dream Big print. I love that you customize it…might take me a bit to figure out what colors I would want it in! I love the rainbow wishes paper print – it’s so great!! You are so talented! I love the “Sometimes you need bad days to realize how good all the rest are”, because it is so true. Good work. Keep it up. All your creations are so beautiful and inspiring it’s so hard to pick! I’ve loved the Rainbow Wishes print since you noted it in your nursery tour so I think it would have to be that one! Best Wishes! I love all of your prints, but the Dream Big Little One might be my favorite. I LOVE the dream big balloon print! I LOVE all the things you have to offer. The business cards are super cute too! Sometimes es sin duda alguna mi favorito, hace días que vengo pensando en algo así. Me ha robado el corazón. Me encanta todo lo que haces pero tu nursery es espectacular. Felicidades!! My favorite item is the Creativity is contagious, pass it on print and I would absolutely love to win it! You constantly amaze me! Your work is beautiful! I love your prints the most! 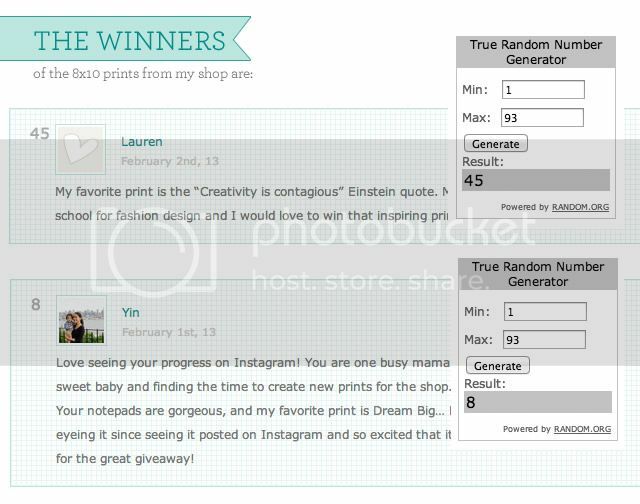 I would love to win the “You look lovely today” print! It’s beautiful! I LOVE all of your new prints, I am crazy about (and would love to win either) the Be silly be honest be kind sign, AND the sometimes print. Both would love wonderful in the room reserved for the foster children we welcome into our home! The Creativity is Contagious is DIVINE! Thanks for sharing your talent with us Joy! I really love the flowered Inspiration jotter but it was hard to pick a favourite! :) The Be Silly Be Honest Be Kind print would be awesome to win. I love all of them but “Be silly, be honest, be kind” has to be my FAVORITE!! great job!!! y felicitaciones por ese hermoso bebe! I´ve been following for a while but it’a my first time posting. I love all of your prints. You are so talented! My favorite is “pretty girls like to sew”. Please keep inspiring the new people diving into crafts! El bebe esta divino! Your prints are so amazing! I love the Dream Big one the best – I’m also loving your business cards. So trendy yet professional! I have been admiring so many of the prints you tweet and love love love the Creativity is Contagious print. I would like to have that one most, because it is the most fitting for me. But I think my favorite would be the be silly be honest be kind – it’s a great quote. I love ur ideas n all ur prints. 2 – What print you’d like to win! Your designs are absolutely beautiful and I would love the chance to win. I have a bit of an obsession with notebooks so the jitters are my favorite! I’m in love with the “Pretty Girls Like to Sew” print. I have a 10-week old daughter and even though I’m a very very very novice sewer… I’d love nothing more to hone my sewing skills and teach my daughter to sew one day. Something I wish I would’ve learned from my mom before she passed away 6 years ago. Everything in your shop is beautiful! I love it all. I’d like to win the “You look lovely today” print. My favorite is the dream big little art print. I would love to win it as well. Thanks! My favorite thing is the print that says craft your stress away. I would love to win that. All of your stuff is lovely! My favorite product is the nursery drawing that is in the white mat and frame. I strongly believe in the power of speaking positive words over children. I would live to win the “I love coffee and my blog.” That about sums me up! You are so talented! My favorite print is the “Creativity is contagious” Einstein quote. My sister is about to go to school for fashion design and I would love to win that inspiring print for her. On getting back to what you truly love to do! congrats on your print launch! Ahhh, to have your talent. Love your designs. Sometimes print! I saw it and immediately was hoping that was what the giveaway was for! Its difficult as I have 2 favourites… “Creativity is Contagious” and “Craft your stress away” I think either would look great in my craft room once I’ve finished reorganising. If I was to win I think you’d have to choose one for me because I can’t decide! The print I would like to win would the Sewing with love. It a toss between Sewing with love and Hello Gorgeous card set from your Esty site, that I like. That was a hard choice I couldn’t decide between “Pretty Girls Like to Sew” or “Craft you Stress Away”, great artwork. It is hard to decide which is my favorite since they all are so beautiful but my favorite is Be Silly Be Honest Be Kind Print and I would love to win that one! Thanks for the give away! I love all of them! The one I love the best is Craft your stress away. Good luck with the shop. Thanks for doing the giveaway. Yes please. Love the somedays ate bad days!!! All are amazing. So talented!!! Love all the new art! I think my favorite is the Sewing with Love notecards…in the black ink on kraft…would actually love that in a larger print to hang in my sewing area! I really like your new print line. Although I am basically a quilter & needleworker, I love art in whatever form it takes. Great job! I honestly like all your products, but especially your prints. I would like to win either the Craft Your Stress Away print or the You Need The Bad Days. . . Print. Frankly, I would be happy with anything from your shop. Congrats on your one year anniversary as well as the launch of your shop. I have been following you from almost the first day and am so happy for all your success and growth. Hi joy, i find it very hard to pick one favorite item. These are amazing, and make me want to draw more. 1. Favorite product would be Paper Print – Rainbow Wishes. 2. Would love to win Sometimes print. Congratulations on launching your new print line. Everything is so awesome, but I love the contagious creativity and sewing machine prints. They’d be perfect for my new creative space! Best wishes and thanks for the giveaway! Your prints are beautiful. My fave print & the one I’d love to receive if I won is the “dream big, little one.” I’ve been looking for something for a specific space in my daughter’s room, and I that print is PERFECT! I like the “Inspiration in pencil” notepad. You can never have enough notepads! 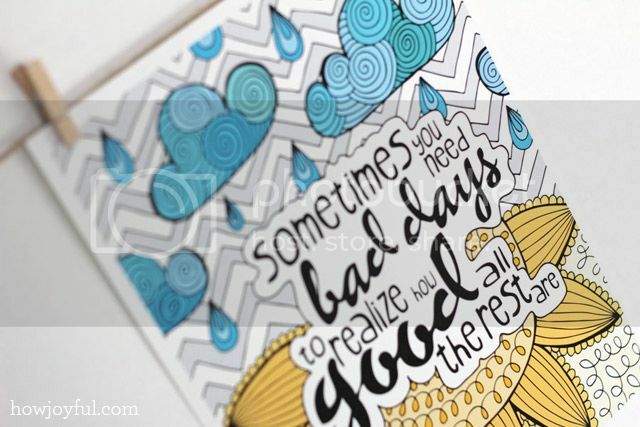 I would love to win the “Sometimes you need bad days” print. It is something I tell my kids all the time to appreciate what they have now! Thank you. I love your prints and have been waiting to see them in your shop since I’ve seen them on Instagram! My favorite, and the one I’d like to win is “Pretty girls like to sew.” That is just so me! I love the Pretty Girls Like to Sew print, I love that sewing machine! And there isn’t a single print there that I wouldn’t love to have/win! Congratulations on your big launch!!! Oh Joy! Your art is so lovely, it’s hard to choose a favorite…I like each of them. My two favorites for my ‘studio’ would be “craft” or “creativity” both are inspiring. I’m so excited for you. What a great launch!! The new prints are absolutely wonderful! I love your “Sometimes you need bad days to realize how good all the rest are” and “Dream big… little one” prints. If I had to choose between the two I’d go for the first one, because I think that it would be a good reminder to keep me going on those days, when things aren’t going my way. I love all your printings, but “Creativity is contagious, pass it on” it’s one of my favourites!! Best wishes and thanks for the giveaway! Joy, the new prints are great! I especially lik the Sewing with Love cards and the Inspiration Jotters. The print I’d love to frame and put into my craft area is: Creativity is Contagious. Lovely! 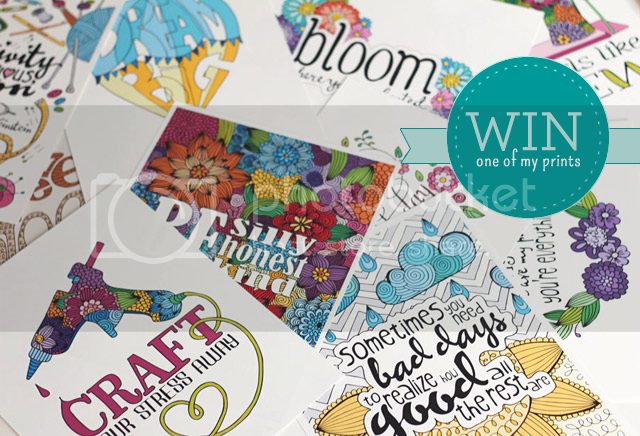 My favourite item is the ‘You look lovely today’ card set; I’d like to win the ‘Craft your stress away’ print to frame and hang in my craft space. I love all of your prints, but my favourite is the Dream Big . . . Little One close followed by Rainbow Wishes! Congratulations on your new endeavour! I love the “Dream big little one” print. If I don’t win it I will buy it. It is adorable! All of them are awesome! The one I like the best is the “Be Silly, Honest, Kind”, that is the one I would want. I love EVERYTHING! It’s hard to pick a favorite! 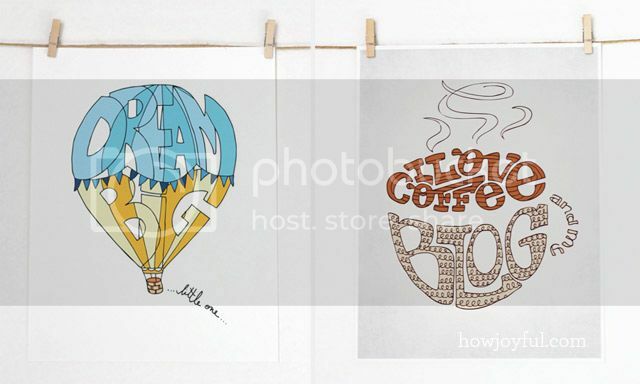 If I had to chose, I’d pick the print that says “I love coffee and my blog!” Cause I so do! Yay, super excited about this new venture for you!!! Wow Joy! Those are amazing! My favorite item in your shop would have to be the inspiration notebook and my favorite print is hands down– Bloom where you are planted. I love the Dream Big print, but the Cherish Yesterday one would go so perfectly in my daughters nursery! Beautiful work! Oh you know I life the ”dream big” print! I really can’t get over how gorgeous they ask are, fantastic job mama! Hello, I hope you will please. I give you a prize “The versatile blog.” Come and get it on my blog. Your shop looks wonderful! Great job! My favorite thing is the Creativity is contagious, pass it on print & I’d love to win it! It’s look great in my craft room! I don’t know which one to pick as my favorite! You are so very talented! I guess my top three are: Sometimes, Pretty Girls and the Cherish yesterday one. I’m working on decorating and fixing my up sewing room (and getting a lot of inspiration from this blog! ), and I think I would enjoy the Sometimes print. Cus I have to say, not everything I sew actually works…It just goes to show the bad sewing projects make the successful sewing projects more fun and exciting! I LOVE the new prints! Actually, I love pretty much everything in your shop :) My favorites are the “Dream Big, Little One”, the “Be Silly, Be Honest, Be Kind”, and the “Cherish Yesterday, Live Today, Dream Tomorrow”. If I had to pick one, I would probably choose the “Cherish Yesterday” one. You are so, so talented my friend. The Dream Big one is astonishingly beautiful and clever.